Richard Elman (1934–1997) was a major figure in literary circles of the latter part of the last century, a consequential presence in our culture’s “scene.” Known primarily as a novelist—for such novels as The Reckoning (1969) and An Education in Blood, (1971)—he was also a social commentator, with such nonfiction books as Ill-at-Ease in Compton (1967), and Uptight with the Stones: A Novelist’s Report, (1973). He worked for New York’s left-leaning radio station, WBAI; he wrote the novelization of the movie, Taxi Driver (1976); he traveled to Nicaragua for Cocktails at Somoza’s (1981). Further, his pseudonymous Little Lives (1978) and his posthumously published Namedropping (1998) were widely reviewed and well-received. Beginning with his study of The Poorhouse State: The American Way of Life on Public Assistance (1966) and ending with the surrealistic novel, Tar Beach (1991) he produced a steady stream—a torrent, really—of prose. There were chapbooks and smaller collections as well, a constant commitment to the genre; his devotion to the work of words stayed with him till he died. 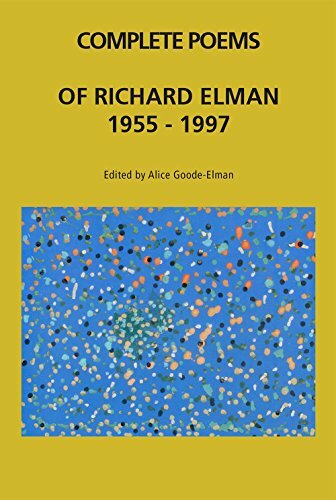 Now his widow, Alice Goode-Elman has brought into print an omnibus volume of the Complete Poems from 1955 to 1997, together with an essay on the task of compilation. Ms. Goode-Elman has appended nearly 300 pages of Uncollected Poems and a publication history of those that did appear. It’s an astonishing labor, one that took years to bring to fruition, and has been worth the wait. A disclaimer here. This is not an unbiased critique. I first met Richard Elman in the mid-1960s, when we were colleagues at Bennington College and became fast friends. We stayed that way till the end. We spoke to each other weekly, often daily; we taught together, shared family triumphs and troubles; we read each other’s work-in-progress, laughed at each other’s jokes and blurbed each other’s books. I therefore hear his accent, his delights and despairs in each of these pages; the voice rings in my ear more than 20 years after his death. what I never will do. In middle age he married well. The poet deployed a colloquial diction and unforced accessible English; he used rhyme at times, free verse at times; long and short lines, short and long forms; he wrote ballads, limericks, sonnets, and screeds. There are nature poems, “occasional” poems, poems written to his wife and children and enemies and friends; there are bawdy poems, comic poems, political poems and personal ones (as with the two examples here above). success, a clutch of mixed results. Some of these verses are written in haste and some composed on the run: improvisational-seeming, a riff. But always Elman wrote with tenderness and wit. looking, as if the scruff was on them. More like lumps or dead weights than fruit. intervention of faults and imperfections. Those oranges that lie “in a heap on the old bird-cage floor” are nonetheless “delicious,” as though the “unpromising” raw matter of “lumps or dead weights” can be made to yield “unfailing sweetness” when “sucked.” It’s a paean of praise to the power of art, the sudden surprising perception that alters how we look at things, so the “great soft pile depleting” becomes a prized object and one that will last. “Brown and flattened out and rather patchy-looking,” the “faults and imperfections” can nonetheless attest to “intervention,” an unseen hand arranging things till they be made to please. So, too, with Elman’s verse. We are often told that poetry’s irrelevant in the present moment. It’s elitist, marginalized; its sales are scant. Where once it was preeminent of our literary modes, first and foremost as a genre, it has become of late the least of them. Yet Homer and Sappho and Shakespeare and Byron—or, more recently, Dickinson, Whitman, Plath, and Dylan—are part of common parlance still, the touchstones of our culture. So it delights me to report that Richard Elman, dead for the full measure of a citizen’s maturity, returns full-force in this collection. He was one of those in whom the language lives.